A retrospective piece on the history of the iPod published last week brought fresh attention to the idea that Apple may be looking to discontinue the iPod classic, essentially the direct descendant of the original iPod introduced nearly ten years ago. 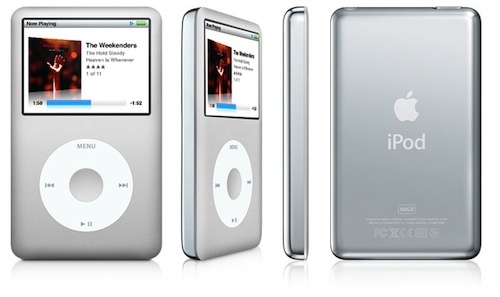 Concerns over the fate of the iPod classic first arose last September when Apple introduced new iPod models for every line except the iPod classic, even as Steve Jobs referred to the revamp as an "all-new" lineup. The iPod classic remains available, but has not been updated since September 2009. The possibility of new life for the iPod classic received a jumpstart in late January when Toshiba introduced new hard drives topping out at 220 GB in the form factor used by the iPod classic, which currently offers 160 GB of storage space. In the following weeks, supplies of the iPod classic appeared to tighten at a number of retailers, potentially hinting at either an update or discontinuation, although Apple has made no moves since that time. With the renewed focus on the fate of the iPod classic, one MacRumors reader let us know that he had emailed Apple CEO Steve Jobs back in September after the device failed to receive an update alongside the rest of the iPod line, inquiring about the fate of the high-capacity music player. Jobs responded, indicating that the company has "no plans" to discontinue the iPod classic. The claimed email from Jobs does appear to be legitimate, and while Apple's plans may certainly have changed in the six months since the exchange, it does appear that the company has been intending to keep the iPod classic line alive despite the absence of an update in over 18 months. With the new 220 GB hard drives from Toshiba now available, Apple could conceivably release an updated iPod classic at any time, although the company may wait until its traditional iPod media event in September for the refresh. I know this is venturing into iOS territory, but the single feature that would drive Classic well into the future for me is AirPlay. No other touchscreen BS; keep it rugged, keep it click wheel, just 160+GB of your fixed and lovingly maintained library, in your hand, poised to beam to the big stereo.